Litigations and Arbitration in Export and Import Business. I hope this article helps all traders in a business especially those who are in to Import Export business - how to handle disputes in import and export trade? I sell goods to you, you buy them, you pay bill, you use my goods. Simple. Both are happy. Right? But is it that much simple in an international trade? I will say ‘YES’ depends up on how fast you are untying the knot. In other words, I will say, ‘Removing hindrances with least time and least money is business’ . Am I right? Let me discuss firstly about causes for disputes under export import business. What are the reasons for Disputes in international business? 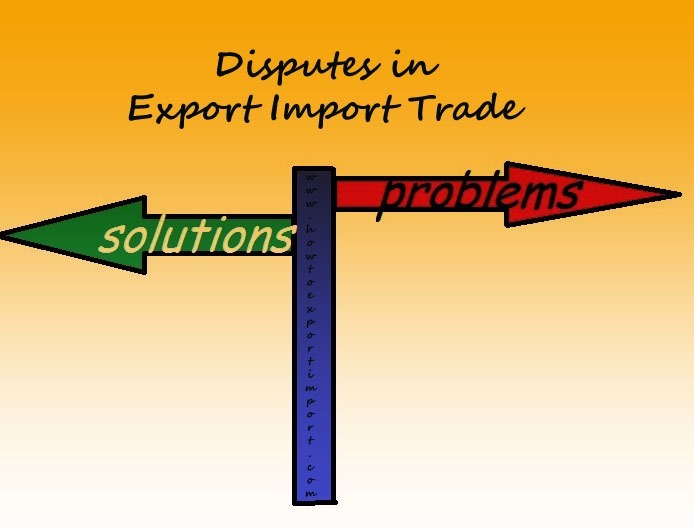 Reasons for disputes in international trade between exporter and importer can be many. As per my experience in import export trade for the past 25 years, the primary reason for disputes is quality of the goods exported. Under contractual terms in many export contracts, importer gets the opportunity to inspect the quality of goods only when the consignment reaches him. In many cases, by that time, the exporter would have got money. Even if the consignment is sent on collection basis, importer can check the quality only after retiring the documents. Other reasons for the disputes can be delayed shipment or non-shipment due to change in government regulations or market conditions, restricting exports, etc. 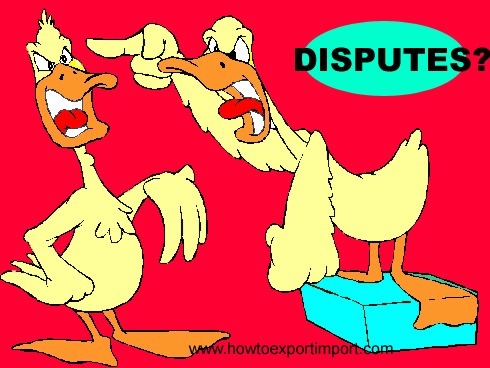 What are the methods of settling dispute? 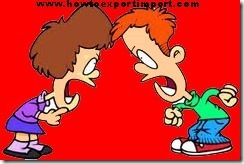 In any business there are two basic methods for dispute settlement - Litigation and arbitration. Litigation is highly suitable due to the proverbial delayed process, prohibition costs and uncertainty of decision. Slow Process: As you know, almost all civil process of litigation is slow. Court process proverbially takes huge time consuming and formalistic. Avoidable Necessity of Export Witness and other Evidence: In international contracts, practices, procedures and customs are different. A judge however well versed may be, in law, can not be expected to know all these intricate matters. So, in courts, to educate the judge about these practices, witnesses who are experts and having knowledge in the field have to be produced to prove the practices, even before the evidence is established. Inconvenience to the Parties: Court timing and date of hearings may not be convenient to litigants. Most of the time, cases are postponed and in that process months drag on even for completion of one witness. Even after day’s long waiting for hearing, one may know, at the end of the day, that the case is adjourned for two months due to non availability of the other advocate! Adverse Public Image: Court proceedings are never secret. Media always covers the developments in important cases. Even the superior court judgments are published. Matters, which have been confidential till the case is brought to a court of law, become topics for public discussion that may bring notoriety, loss of goodwill and long-standing reputation. Bitterness and Disruption of Trade Relationships: When a matter goes to a court of law, it is immaterial which party may win as the age old established relationship, after the case is brought to litigation in a court, comes to an end with only acrimony ad bitterness. Different Laws and Procedures: International trade laws and procedures are more complicated. Litigation in foreign courts is more expensive and difficult in comparison to the domestic courts. OK, Now let us discuss about Arbitration under Imports and Exports. 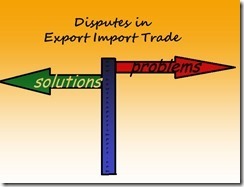 How does arbitration helps exporters and importers if dispute arises? How fast arbitration can take place under a dispute between buyer and seller in export import business? How expensive compared to litigation under export import dispute between seller and buyer? How does an arbitration under international business effect Goodwill of both exporter and importer? What about the confidentiality about the dispute between importer and exporter in an international trade? What are the basic Advantages of Arbitration under a dispute between seller and buyer in export import business of international trade? Quickness: Definitely, arbitration is quicker than litigation. Process of arbitration can be completed as fast as the concerned parties desire. Under Arbitration Act, the arbitrators have to make the award within four months from the date of completion of all proceedings. Usually, arbitration is settled within a period of four months to one year. Inexpensiveness: Total incidental expenditure in arbitration is always much lower than litigation. Arbitration fees is around 2% of the claim value or less in institutional arbitration. Promotes Goodwill: As the arbitrator is chosen by both the parties, based on their faith and his competence, arbitration becomes a normal process of goodwill. Arbitration proceedings and its outcome do not disturb the existing friendly relations between the exporter and importer. Choice of Appropriate Arbitrator: As the arbitrator is chosen by both the parties and name incorporated in contract, who has the knowledge of customs and procedures of international trade, so separate expert witness for educating the judge does not arise. Privacy: Arbitration proceedings are not open to public. Arbitrator’s award is not published in any newspapers. This preserves privacy of the parties. So, trade secrets as well as disputes arising from the contracts do not become public. In next article, I will explain about HOW TO RESOLVE AND SETTLE DISPUTES BETWEEN EXPORTER AND IMPORTER UNDER INTERNATIONAL BUSINESS. In this article, I have explained about Litigation and Arbitration under dispute between Exporter and Importer in an International Business. Had you experienced Litigation and Arbitration under dispute between you and your customer? Would you like to add more information about dispute between importer and exporter in International Business? Share below your experience in handling dispute between you and your customer in Export Import Business. Comment below your thoughts about this article – Dispute settlement in Imports and Export business, Litigation and Arbitration. yousaf: On 23 August 2014 If a buyer pay advance against a PO from usa and the seller does not sends shipment . How the importer should proceed. How much time it will take? Please answer. M.M.GULATI: On 17 October 2014 17.10.2014 - Arrange to waive the condition of completing annual average export performance under epcg scheme and relaxation may also be given to exporters against old cases of epcg where matter is now totally beyond the control of exporters because of one reason or the other.It is very very important to see the issue because many exporters are suffering due to above condition and no any govt. authority is listening which is truth and hard fact. Aditya : On 09 January 2015 Its been over six months since I exported the material to a buyer in Guyana. Over these months he kept assuring me of the transfer but he has failed to send the funds. Is there any legal help I can seek? ashfaq ahmed: On 13 January 2015 Our company has received advance against exports from the foreign buyer. When the material got ready. The foreign buyer could not lift the material from our company. How the advance payments can be written off / adjusted as per RBI Rules hence the finished material is of unique type and could not be sold in India.Please advise us. Admin: On 26 January 2015 Hi Ringoo, There are many ways of sourcing fund for export import trade. Approach a good export import consultant near your area to get proper information on finance for exports imports. Jjyaja: On 06 February 2015 Hi Admin, I am Jiyaja what happened if i import from china to india and due to dispute i dont want to make payment to exporter. Is any formalities attracted as per indian FEMA & FERA or others. Plz guide me. Admin: On 07 February 2015 Hi Jjvaja, You can reject goods before completing import customs clearance. If you suspicious on quality of goods, arrange a first check procedures under import customs clearance. If found not satisfactory, you can reject goods. Consult an import export professional for further details. ramkesh: On 06 April 2015 i want to the documents about related to shipping and what types of documents required in import and export. sandeep: On 22 April 2015 if i get an export order for empty hard gelatin capsules which have to be printed with specific word. i get 50% advance for the order, i start manufacturing .the shipment is ready. the understanding is buyer will send balance 50% before shipment & after that BL copy is to be sent to buyer directly. now for some reason buyer is not paying 50% balance what to do. the consignment cannot be sold to others since specific printing is done on capsules. pl advice. Amit: On 11 June 2015 Hi All, Ive shipped cushion covers to a UK buyer and the buyer which was otherwise ok in payments is now holding on the payment for over a year. I can smell some bad intentions and want to seek some legal remedies. Over the email, buyer has agreed that so n so amount is outstanding and is willing to pay but not now. this is going on for almost one and a half year now. which authority helps in such cases. Is there a way by which such buyers with unethical practices can be banned, or their shipments held up till they pay other vendors. shivang dixit: On 04 August 2015 Hello hey admin this is shivang , plz tell me how to knw that the 3rd party(foreign buyer) is fake or not? how to know that? Shrey: On 17 June 2016 Hi! We released 100% Payment to exporter but they are not releasing OBL saying we do not get payment. We also have proof of payment but exporter also stop replying. We have following questions. 1. Can we get goods delivery from shipping company without submitting OBL? 2. Are we liable to pay shipping and concor detention / demurrage charges if we do no get OBL from exporter ? 3. We already paid custom duty on based of copy of documents. We contact custom department and they says you can not get refund of custom duty because container is out of charge. Is it like so ? We believe there must be provision to get refund of custom duty. Pl inform. Thanks in advance. Ranjith kumar Reddy: On 05 August 2016 First of all I should appreciate you for creating http://howtoexportimport.com/. It was really byfar the most helpful information on import and export. Thank you very much for creating the website. I need your advise on exporting and hence this mail. Let me first tell you what I'm thinking. I want to sell a disposable plates (manufactured in India) in amazon (in U.S). Amazon provides a service called "Fulfillment By Amazon (FBA)" where the seller can send large quantities of the product to amazon warehouse and amazon stores the product in their warehouses and handles the delivery/returns of the product. I'm sure that the seller can be from any country and don't need to setup any company in U.S to do this as they are many people(not from India but from other countries) who are already doing it. So, importing in US is not a problem. My problem is with the export leg "how to export from India if there is not already a buyer". How can I myself export the goods when I want to sell it retial in other countries? The problem arises because there is no definite importer before hand. Can you please help me with your expertise. It would be very very helpful to me. Moeenul: On 23 October 2016 If I release goods from port which imported by LC, but after releasing the goods found is bad quality,Bank bill not accepted. but goods released by bank documents.then what is our doing from importer's bank. BIPIN PATEL : On 31 October 2016 We are base in Gujarat State, recently I have imported one product requiring cold chain (Antibody Protein for animal use) from South Korea, Cargo stuck down in EMS (POST) for more then 1 month and ultimately material was spoiled due to storage in room temperature. Now exporter is ready to give me free replacement, what procedure / documentations I should require to do for import of free replacement???? Amount of custom duty was Rs.15000/- , Should I require to Pay it again???? sainath: On 29 March 2017 Dear Sir,We received advance from South Korea for manufacturing & selling of material to South korea. Now we need to get one material from another korean vendor to supply the material directly to my customer whom given advance to us. And then that transaction need to be set of against the advance in India. Please help me how to do? and wat document i need to submit to banker for settling the advance. ASHISH KUMAR: On 30 June 2017 Dear Sir, We are manufacturer in Taiwan and I am their authorized representative in India. We have Send Goods to our Indian Distributor, he has made partial payment . now for balance payment he is blackmailing us and not making payment to us asking undue advantage . when we denied he is not making payment to .............. what we can do with him legal in india or we have to file case against him in our country . Abhishek Jain: On 13 March 2019 Dear Sir, Please suggest how to close the import payment standing in IDPMS system in case of non import and payment not refunded from exporter. Nagendra Kumar: On 26 March 2019 Dear Sir, I recently imported cut to size granite (for flooring and kitchen purpose) from one of the exported in India to Germany. Before placing the order I had made sure that they export it on time, which they also accepted. But after placing the order, and paying initial 50% of the money, the company started delaying the order. They took more than 3 months to finish the order and ready to ship them. After paying the remaining 50%, they shipped the items. After receiving the granite in germany, I noticed that the quality was really bad. The specified size was not maintained. Most of the granite tiles had uneven cuttings, edges damaged, and the thickness was not uniform. This is useless to be used for flooring purpose. When I informed this to the exported, he was not ready to accept it. He said he will check with their quality team and will get back. But he never replied back after that. Could you please let me know how and where I can complain or lodge a complaint against such exporter. Can I get atleast some of the money back. Thanks in advance for the reply.